My name is Emma, and I’m sixteen years old. 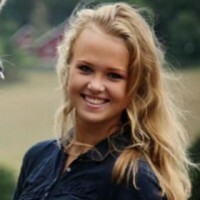 I come from Tønsberg in Norway, and I’m a student at Skagerak international school. I enjoy horseback riding and being with friends. I want to support Batór Tabór! I think this organization is amazing, in the way that it gives everyone a fantastic chance to be together and have fun, even if you have a special illness or a difficulty. I want to help children with chronicle sicknesses, and give them a fantastic chance to have a “day off” from the disease where there is no worries, and a time for them where they can think about something else.